For fish oil users who also want the highest quality bio-available CoQ10 for optimum heart health support! Plus... If you're taking cholesterol-lowering drugs – then New Zealand's exclusive Omega 3/QH Ultra Fish Oil is definitely for you! If you're taking cholesterol-lowering drugs – and not taking CoEnzyme Q10 (also known as “CoQ10”) you may be headed for serious health problems. Numerous scientific studies from prominent universities now prove popular cholesterol-lowering drugs can significantly lower your precious levels of CoQ10! Researchers discovered that statins used to block the manufacture of cholesterol by the liver also block the production of vital CoQ10. Boost energy in your cells! Support healthy blood pressure levels! Maintain brain health and function! Cellular support to maintain healthy functioning! Resist the aging process in your body! That's why if you're taking statins, you must take CoQ10 supplements to support your heart and circulatory system as well as to maintain overall health. Not all CoQ10 are alike. In fact – some are virtually useless – especially if you're over 40. Omega 3/QH Ultra Fish Oil formula contains bio-available ubiquinol – the right form of CoQ10 your body needs – to immediately create the energy your cells need for optimum performance! Bio-available Ubiquinol – found immediately in every serving of Omega 3/QH Ultra Fish Oil – helps support healthy heart function and boosts your energy levels. Ubiquinone simply can't do this until it's converted to Ubiquinol. Most people over 40 can't properly convert Ubiquinone into the bio-available Ubiquinol for energy. Thanks to Omega 3/QH Ultra Fish Oil – you don't have to! You've got bio-available Ubiquinol ready to go to work for you. Ubiquinol has two more electrons than Ubiquinone – making it a more potent antioxidant! Ubiquinol can then donate the 2 extra electrons to help neutralize free radicals! This is a huge benefit for fighting free radicals. Ubiquinol is 3 – 8 times more effective than ubiquinone. There are cases where doses of Ubiquinol have been given at only 1/8th of the rate of Ubiquinone and yet the blood levels of CoQ10 have doubled. This suggests that in that instance Ubiquinol was up to 16 times as effective. Omega 3/QH Ultra Fish Oil contains the only genuine Ubiquinol produced by Kaneka in Japan. Other manufacturers may use cheaper, less effective forms of Ubiquinol – but you won't get the optimum health benefits with those imposters! Stick with the real, genuine, proven winner – and your body will thank you for it! So it's actually a “no brainer” – if you're taking cholesterol-lowering drugs or want extra support for your heart’s health and function – the absolute BEST choice for you is Omega 3/QH Ultra Fish Oil formula – containing Kaneka QH® Ubiquinol. You get heart health – and so much more! Omega 3/QH Ultra Fish Oil helps support a healthy circulatory system and healthy heart function – and if you're taking cholesterol-lowering drugs – this remarkable formula gives you a little peace of mind – knowing that you're keeping your CoQ10 maintained at healthy levels! Great looking skin: Combining Lyc-O-Mato® lycopene extract with AstaPure® astaxanthin delivers remarkable skin health benefits in every serving! Clinical studies on these powerful antioxidants show benefits in regard to skin redness... scaling... and density. Additional prostate support! Lyc-O-Mato® lycopene extract belongs to a class of carotenoids that have been shown to be effective antioxidants which may help support and maintain prostate health and function. Contains New Zealand Hoki fish: Harvested from the pristine waters of the Southern Ocean off the coast of New Zealand. Thanks to the equatorial currents which prevent many of the contaminants in the Northern hemisphere waters from crossing the equator – these are some the purest waters found in the world. Pure concentrated Tuna oil: Processed for the highest level of purity and concentrated to meet our strict standards! This assures you receive the quality fish oil your body needs. High DHA content: DHA is known as the most valuable component of fish oil. Xtend-Life's Omega 3/QH Ultra Fish Oil now contains our new and improved fish oil formula which contains even more DHA (700mg) in a single serve. Supports the body’s inflammatory management processes: Inflammation is a natural process that occurs in the body and is something we all need to survive. However, poor lifestyle choices and anti-inflammatory drugs may negatively impact the body’s ability to manage inflammation effectively (also known as immunomodulation). Fish oil helps support the body’s ability to manage inflammation and return inflammation to a healthy balanced state (also known as homeostasis). Bio-availability! We use hoki fish oil in the form of natural triglycerides and tuna oil in the form of concentrated esters! This makes Omega 3/QH Ultra Fish Oil highly bio-available – so your body can properly utilize our formula for maximum benefits. Freshness! We never use additives or flavoring to mask rancidity. What's more – you won't experience embarrassing “fish burps” or smells with our fish oil. Support healthy blood pressure - and resist "the silent killer"
Our Omega 3/QH Ultra Fish Oil blend is ideal if you want the absolute finest fish oil available with additional heart support and beneficial skin properties! PLUS: If you're taking cholesterol-lowering drugs – this is a must-have formula for you! Other Ingredients: Soft Gel (Gelatin, Glycerol, Water, Annatto [color]), Beeswax, Antioxidants Vitamin E Oil, Rosemary Extract and Ascorbyl Palmitate (to preserve freshness). If you are pregnant or lactating, see our standard Omega 3 / DHA Fish Oil. If you are taking a blood thinning medication or aspirin, please consult your doctor before using this product. Daily serving: Adults – 2 to 4 soft gels. 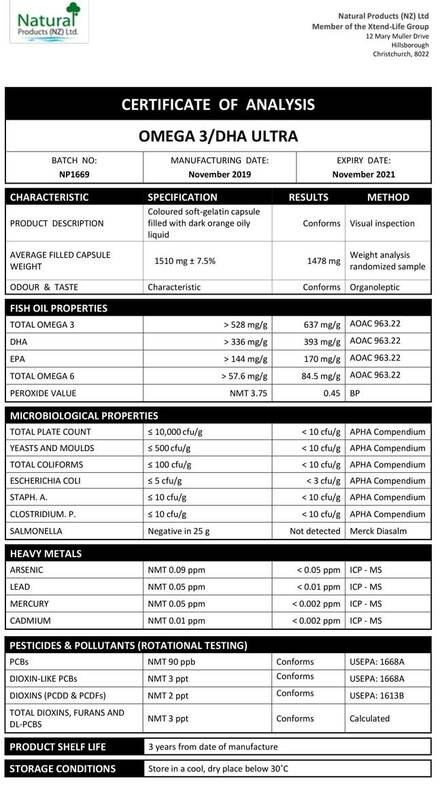 We have included below a copy of a typical Certificate of Analysis (CoA) for our Omega 3 / QH Ultra Fish Oil product. You will note that there are two columns which are headed 'Specification' and 'Results' respectively. The specifications are simply our minimum standard to which each batch of Xtend-Life Omega 3 QH Ultra Fish Oil has to conform, otherwise we would not release it. The results are the actual results from the independent laboratory that did the testing. Who should use Omega 3 / QH Ultra? If you are over the age of 40 years your levels of CoQ10 start rapidly declining. CoQ10 is critical for heart health and needs to be replenished as we age. Also, if you are on a cholesterol-lowering medication such as a statin, it is crucial that you supplement with CoQ10. This is because the metabolic pathway that enables your liver to manufacture cholesterol is blocked by statin drugs. That same pathway is also used to enable the liver to manufacture CoQ10. So the production of CoQ10 has also affected with the result that your body uses up its reserves of CoQ10 and serious health issues can then evolve from that. Is Omega 3 / QH Ultra similar to the Omega 3 / DHA Premium? Yes, it contains everything that is in Omega 3 / DHA Premium, PLUS the CoQ10 in the form of the genuine Japanese Kaneka Ubiquinol. That is the key point of difference for this product which makes it the flagship version of our Omega 3 family of products. What is so special about the Ubiquinol form of CoQ10? The ‘normal’ CoQ10 is called Ubiquinone which is oxidized. The body has to convert it to the non-oxidized form called Ubiquinol in order to use it. The advantage of using the non-oxidized Ubiquinol form is that it is 5 – 8 times more potent than the other form. However, it has two drawbacks. One is that it is a lot more expensive than the standard Ubiquinone and secondly that it is very unstable and requires specialized handling during the manufacture of the soft-gels. Xtend-Life pioneered the technique of blending the Ubiquinol into the oil under a nitrogen blanket which avoids any oxidation and thus degradation. NOTE: The balance of the FAQs are as for our Standard Omega 3 DHA/Fish Oil without the additives.